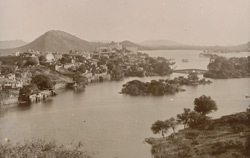 Photograph of the city and lake at Udaipur in Rajasthan, taken by Raja Deen Dayal & Sons in the 1880s, from the Curzon Collection: 'Views of places proposed to be visited by Their Excellencies Lord & Lady Curzon during Autumn Tour 1902'. Lord Curzon served as Viceroy of India between 1899 and 1905. Udaipur was chosen by Maharana Udai Singh (r.1567-72) of the Sisodia Rajputs as the new capital of the Mewar State in the mid-16th century. This followed the sacking and possession of the previous capital, the hilltop fortress of Chittorgarh, by the Mughal Emperor Akbar (r.1556-1605) in 1567. Udaipur lies in a valley beside three artificial lakes, the largest of which is Lake Pichola. This is a general view looking across Lake Pichola towards the city with the hills in the distance. The white domes and towers of the massive City Palace (c.1567-c.1734) rise above the rooftops. Beyond the bridge are the island palaces of the Jagmandir and Jagniwas, in the main part of the lake.